Accidents are bound to happen during house-training. Chill. 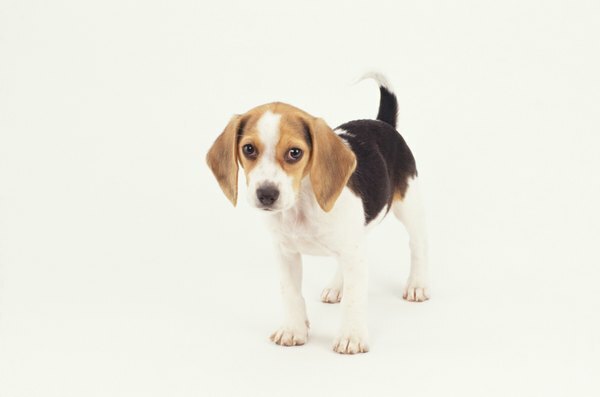 Housebreaking your puppy can frustrate you while he struggles to grasp the concept. Piddle spots will happen as he learns, which can only add to your aggravation. Handle these slips properly so you don't cause him unnecessary stress and fear, likely resulting in regression in the training. A puppy's brain is only so big. Playing, eating and sleeping sometimes dominate your fur ball's every other thought. Excitement over a new toy, or a taking an extra-long nap, can make your little guy forget he needs to go outside to do his business. Rome was not built in a day as the saying goes, and your puppy won't be completely house-trained in that amount of time either. Recognize that accidents come with the territory of puppy parenthood; unless he seems sick, these little puddles are simply par for the course. As frustrating as it is to find a pee puddle or poo pile on your living room rug, control your emotions. Do not yell at your puppy or rub his nose in the mess; do not give him a swat on his bottom. Reacting with anger is not just wasted energy but is regressive in result. Displaying anger will not stop future accidents; it may cause more as your puppy becomes stressed and scared of you. House-training your puppy comes down to A, B and C -- Always Be Consistent. Take your pup outside every two hours, and immediately after waking, eating or playing. Keep regular mealtimes and train your puppy to a crate if you plan to be out for a few hours. Proper crate-training is an effective housebreaking effort. If you catch him in the act of going inside the house, surprise him by clapping or calling his name loudly. This will make him clench and stop going. Pick him up and offer gentle reassurance as you rush him outside to finish. Thoroughly clean any potty spots inside with cleaners designed to break down the smell. Otherwise, if he still smells the pee or poo, he'll wander to that area again the next time he has to go. Puppies love to please; once your little guy knows what's expected of him, he'll have no problems going where he's supposed to. Encourage him to do his business as you wait outside with him. It may take a while at first, so be patient. When he finally goes, praise him to high heaven and offer a treat. This encouragement helps him remember that relieving himself outside is good, which will help future potty trips.